We almost didn’t leave Bend. 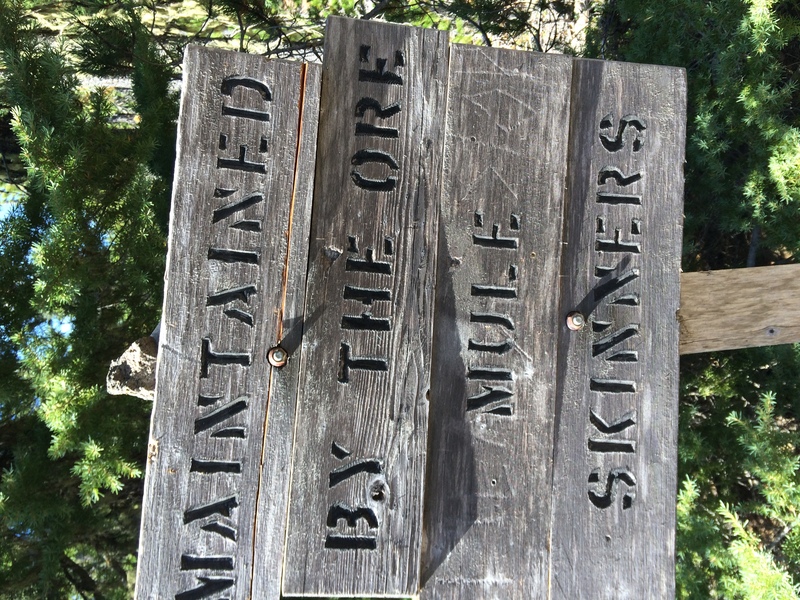 We spent our longest stay of any town there, enjoying the incredibly hiker-friendly atmosphere and making sure we were ready for the haul ahead. Bend is one of the last stops with a real outfitter and good grocery stores, so we stocked up on the things we need – which turned out to mostly be beer and good food. While we were there, we had some visitors! Olivia and her boyfriend Aaron dropped in on us during a road trip. Olivia was in Americorps with Toe Touch, Camel, and I – but for some reason she didn’t decide to drop everything and hike the PCT with us this summer. I guess you can’t win them all. 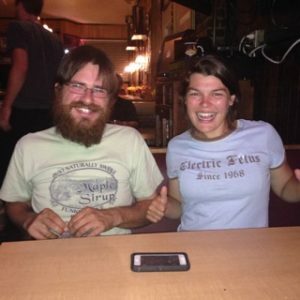 It was so much fun to catch up with her, meet Aaron, and talk about NWSA days back in Trout Lake, especially since we were getting so close on trail to our old stomping grounds. We had such a good time, we didn’t remember to take any pictures so there is no proof of our meeting. You’ll just have to take my word. We also saw another familiar, unexpected face in Bend: Soulflute! Those of you who knew Spoon during our AT hike might remember the story of what, to us, was our most memorable moment on trail. On one pretty unremarkable stretch of trail in New Jersey we came across three teenage Hasidic Jewish boys who had accidentally driven their SUV a surprising distance onto the Appalachian Trail, wedging it between two trees. Soulflute, who we had caught up with that morning, jumped into action and not only freed the car, but provided some very confused boys with an impromptu song from his wooden flute. Of course, who else would come rolling into town at the last moment and surprise us? We left Bend in possibly the most appropriate vehicle: a converted school bus. Soulflute bought an old short bus, pulled out the seats, put down hardwood flooring, and made a portable house for his mobile lifestyle. We learned quickly that riding around in it means getting asked a lot of questions – and getting passed frequently. After driving us back to the lava field in style, Soulflute kindly offering to accompany us for the first few miles of our hike through the shoe-eating lava rock. 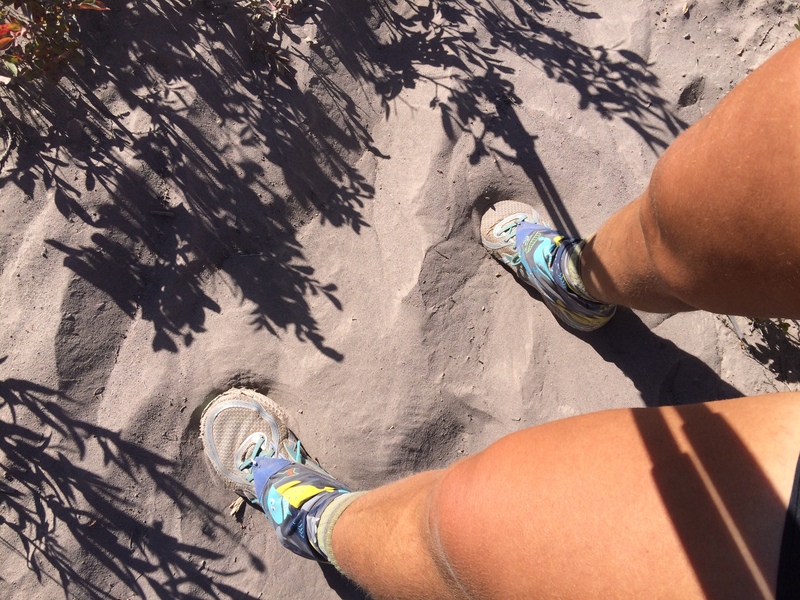 Lately, the dust from these volcanic areas has taken a toll on our feet. The shoes I got in Crater Lake are completely falling apart after a hundred miles. Dry earth mixes with sharp particles of micah and obsidian and grinds against our toes all day, creating new blisters on old callouses. 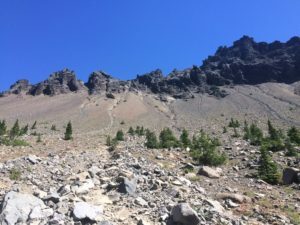 But hikers take issue with this for a different reason than our gear or our skin; Although the complaint seems illogical for people who just spent three days in Bend, we’re losing too much time. Every night now we have to clean our feet meticulously and bandage them. 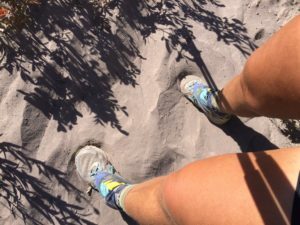 It’s a cautious process, because pulling off a sock causes plumes of the infectious dust to fly up and settle in our tent, grinding into our sleeping bags and clothes. We have started washing our socks midday and drying them on the back of our packs to at least create the illusion of cleanliness. And in town, our laundry process now includes twenty minutes of pre-washing our socks first. Slowly, very slowly, it feels like the dust is burying us. After Soulflute left us, Centerfold, Spoon and I ran into a section hiker who hiked with us for a few miles. It was nice to have people to talk with while we hiked; Spoon and I have, after 2,000 miles, run out of things to talk about. The awful prehistoric bird I’ve been ranting about started cawing and the section hiker we met said “Oh my God, what IS that?”, which immediately made me like her. We got to Big Lake Youth camp, took a break, and decided to push on a few more miles to a small pond where we camped with Centerfold. 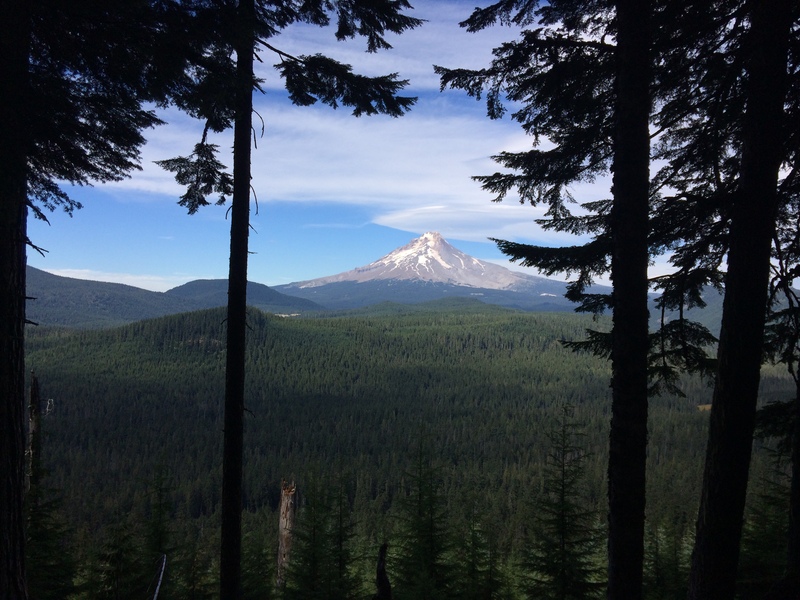 Oregon has become a forested display set for a new mountain every day. We could see Washington in the distance, walking through the lava. After crossing mile 2000, Jefferson looms ahead, peering in at us through gaps in the foliage. 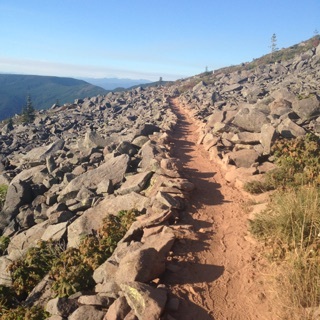 Maybe because of the on-trail dust bowl or the lack of many significant views, we started to lose our energy in Oregon. In an area where most hikers are testing themselves, pushing to make 30 or even 40 miles a day, our enthusiasm was waning. As usual, the trail delivered unexpected inspiration. We were cutting a pretty lazy pace one morning when we saw two young women coming our way. From the size of their packs, I assumed they were day hikers or out for the weekend. 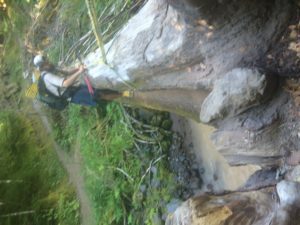 We see so many hikers on Saturdays in Oregon, we’ve learned to keep our heads down and charge ahead or we’ll be having the same conversation all day. But when we got closer, I looked up and realized it was Poptart and Flower! 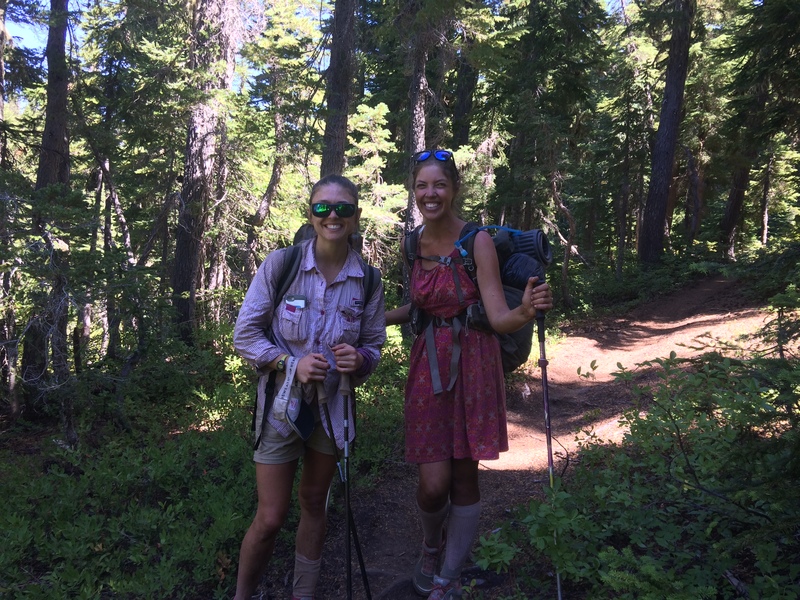 Poptart (alias Carly Moree) and Flower are both independently going for the unsupported record of the PCT this summer. They unintentionally started the same day and, after realizing the other one was out there, decided to hike together. 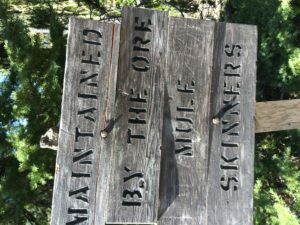 They’re moving more than 40 miles a day, every day – and walking into towns to resupply. We were so excited to run into them. It was like meeting a celebrity on trail. Also, Spoon got to ask them if their attempt counted as an ’emotionally’ unsupported record, which is a joke he’s been saving for the past week. For the record, it went over well. After running into Poptart and Flower, who had been in Canada only a couple weeks ago, we got some of our motivation back. 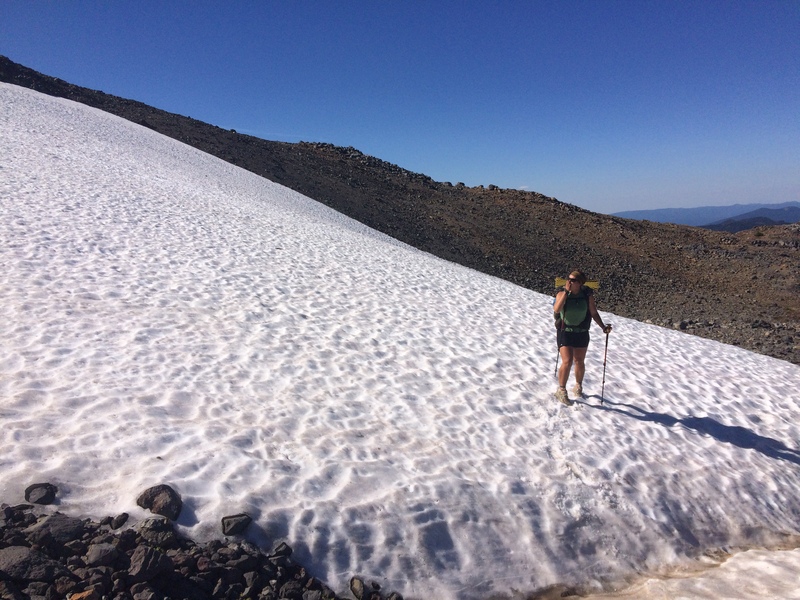 We had wings up a climb that got us out of the trees, and soon we found ourselves on a windy ridge staring at Mount Hood dominating the horizon. The more familiar landmarks we see that remind us of our time living in Seattle, the closer we feel to actually finishing this thing. 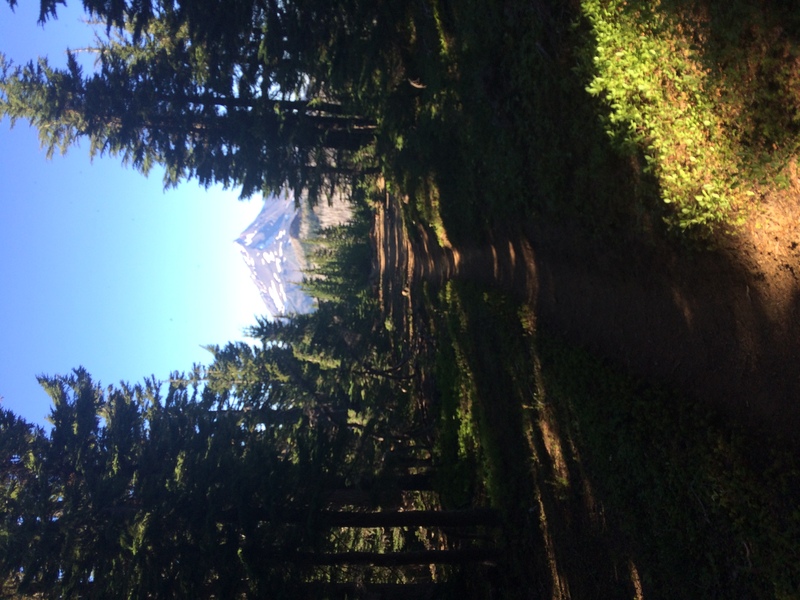 And Mount Hood is a very special example. 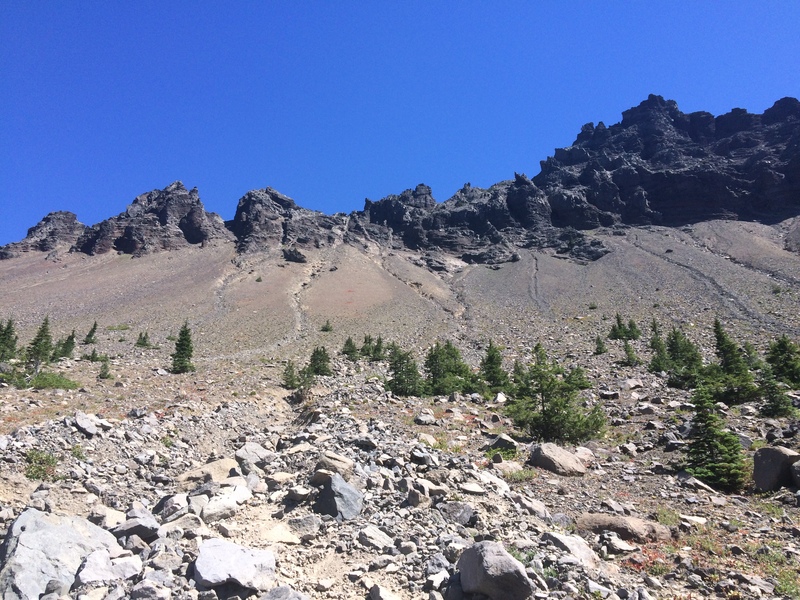 We heard so much about the Timberline Lodge but never went there while we were out West; now we’d get to walk up to it. We made it to the Olallie Lake campground as dark started to settle. We figured we were way too late for the store, but then we saw the sign: open until 8PM. It was 7:55. We didn’t have time to figure out the most direct route; we split up and each took a different path through the campground to reach the store. After running through the campground, dismissing greetings from the other thru-hikers with “Can’t talk, got to get beer”, Little Spoon’s diligence paid off and he reached the store first. That night, we stayed up later than usual (which is to say about 10PM), talking around the picnic table with other hikers. We admitted to feeling like we were dragging and one of the other hikers said, “I know there are people who are flying through Oregon, but you know, if I make it 25 miles, I think that’s a good day”. We sat outside the store that next morning, enjoying the novelty of coffee and being able to watch the morning unfold. Families rented canoes and took off from the docks, the snow-capped Jefferson hung over the lake and the store keepers couldn’t seem less concerned about time. We thought about how we were feeling rushed without knowing why. The weather hadn’t turned, we were more or less on schedule to finish in 5 1/2 months still, and Canada wasn’t going anywhere. But still we feel like we’re being pulled in by the low tide of Washington, as if the state has us in its undertow. Stopping doesn’t feel natural anymore; it feels like fighting the current. Every day is full of reminders now of how close we are. Leaving the store, we walked through the Warm Springs Reservation over turnpikes that Toe Touch and I built alongside the native kids. 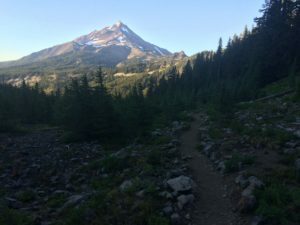 Then we wove through a stream of weekend traffic as we rounded Little Crater and Frog Lakes, including several mountain bikers who didn’t seem to realize the trail was closed to them and several horses which we sincerely hoped did not meet the mountain bikers. The day was a blur, with us rushing to get to Timberline that evening. 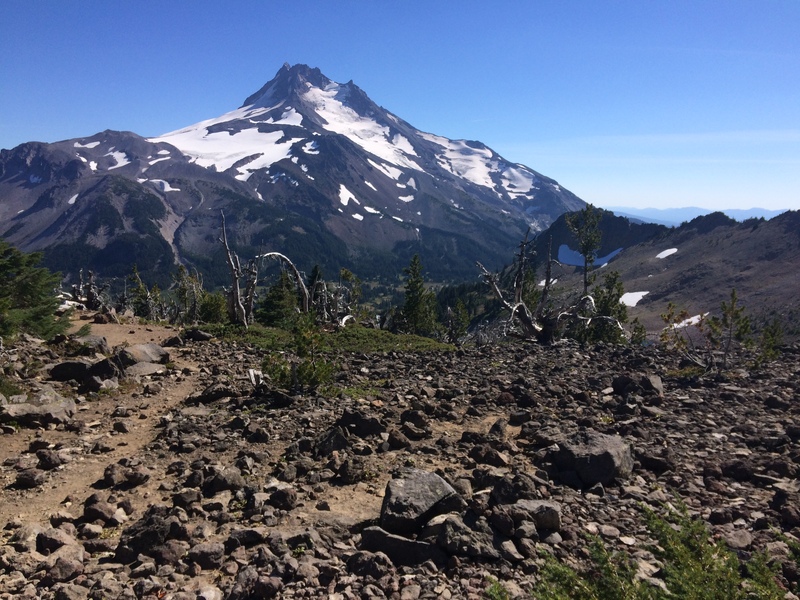 At an outlook, a text from Centerfold came through saying he was waiting for us at Timberline. Of course, we lost him after the first day as usual and weren’t planning on catching him until Cascade Locks, so this gave us some motivation. The temptations to camp were many that day. We got to the road going to Government Camp and ran into a group of hikers camping early. 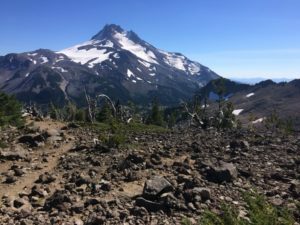 One of them was a section hiker who was setting up his tent – a giant, heavy dome – which prompted the NOBOs nearby to start this Marx brothers exchange with him, “What kind of reception do you get with those poles?” He laughed and said, “You know what they say about guys with big poles. Big tents.” And the conversation literally went on like this for minutes, a hilarious display of hikers’ terrible, end-of-the-trail humor. But we pushed on. We came to our water source as the sky started to get pretty. There was a group of people camped there as well, but we filtered quickly and moved on. After sunset, we passed a big group of hikers huddled around a campfire, telling stories. We paused there, but then we pushed on. I should mention that we were also going uphill. Also that, in all honesty we were more motivated by Timberline’s famous all-you-can-eat breakfast buffet than seeing Centerfold. Darkness fell and we came out on top of the massive, exposed sand field leading up to Timberline. The lodge lights blinked ahead and ski lifts hung silently above us, blotting out patches of stars. The wind was strong and soon sent clouds to obscure the night sky, leaving us in darkness. The lights a mile ahead of us indicated camping, breakfast, and Centerfold – but we couldn’t reach them. The whole trail up was covered in loose, shifting sand. It sucked at our feet, pulling them under until they were completely submerged. We forced our way ahead, losing 3 steps to every 4 we took. 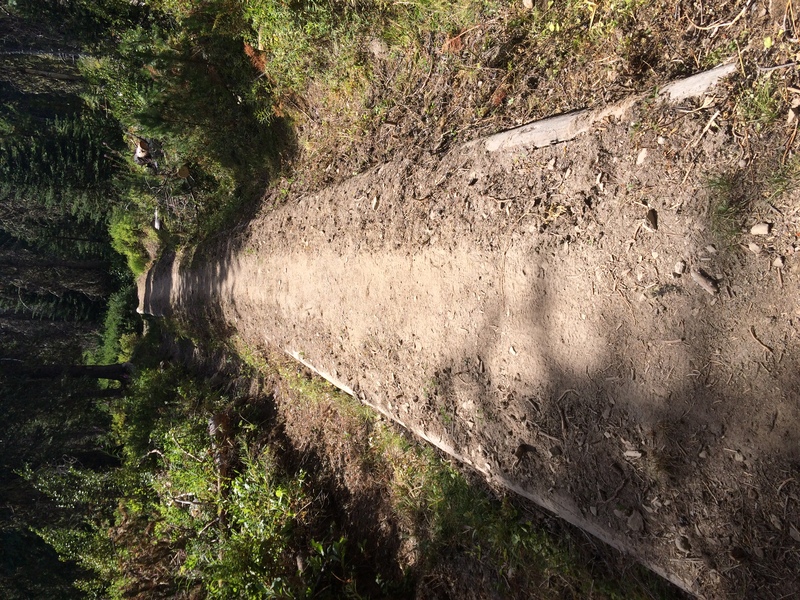 The trail grew steeper and the ground was sliding out from under us. We reached out for anything to hold onto, grasping at bushes and roots, scrambling the whole way. It started to feel like a nightmare, the kind where you’re running with no forward movement, stuck in time. After about an hour, we made it to the lodge and threw our tent down on the first campsite we found. The lodge was having an event and the music crept into our tent as we drifted off to sleep. We woke up, stepped out of our tent, and saw Centerfold. Apparently we camped almost next to him. 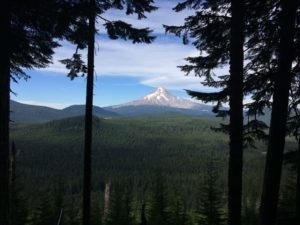 We also saw Mount Hood larger than we had ever seen it in the morning light, standing behind the lodge like a protector. The lodge was gorgeous. We spent all morning and afternoon there. In the presence of the old architecture and the history of the lodge, our own schedule was overshadowed. We stuffed ourselves at the AYCE buffet; actually, Centerfold overheard the waitstaff laughing at how much food I ate, which made me pretty proud – they do have a pretty high gluttony bar to hold me to, after all. 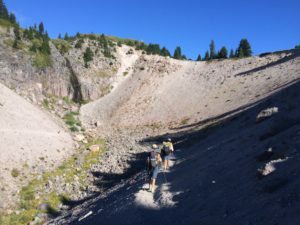 We all headed out around 2:30 and it was fun to hike with Centerfold again, even when we took a wrong turn down a ridge and got waylaid by what I can only describe as a sand slide. We picked huckleberries as we walked, stopping after about ten miles at a campsite with another NOBO, peaches, and a SOBO, Medicine Man. We made a rare fire that night and sat around it chatting. At one point, Peaches said, “I don’t know about the SOBOs we’re seeing now, I don’t think they’re going to make it”, to which Spoon said, “Medicine Man is right next to you!” Peaches looked over and said, “Oh. Um, I didn’t mean you”, and everyone, Medicine Man included, started laughing. “I’m just going to make it as far as I can,” he said. After a lot of big mile days out of Bend, our lazy Timberline day had taken our mind off of our forward momentum for a little while. Over the next two days, we experienced something completely new for the PCT: moisture. 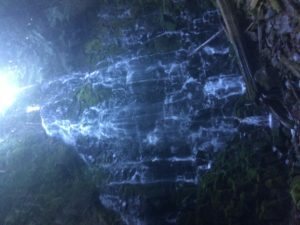 We passed Ramona Falls cascading down a slab, and took Eagle Creek trail through Tunnel falls and around the moss-covered cliff edges that slid steeply down to cascading water. After our sandy Bedouin experience in Oregon, everything was suddenly wet. For the first time that we could remember that summer, we felt humidity. Leaves dripped water on us, condensation formed on the inside of our tent, and the spongy ground finally stopped filling our shoes with dust. At night, our feet looked almost clean. 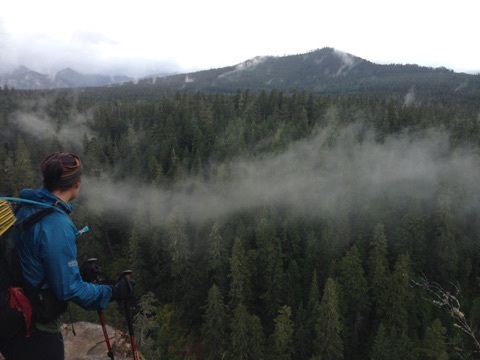 As we hiked out on the Eagle Creek alternate, grey clouds misted above us and we stared at them in awe. We hadn’t seen real precipitation since the Sierra Nevada range, more than a thousand miles ago. It was an eerie feeling, entering Cascade Locks. After all of our rushing, the last state seemed much more formidable than we expected. We had been expecting to feel ‘almost there’ when we reached the Washington border, but now fog hung in the air over the Bridge of the Gods and a cloud veil covered the peaks in front of us like a curtain before show time. It was hard not to feel like something big was in front of us, even as we sat in town, warm and full of fresh Salmon. Outside the window flecked with water drops the Bridge of the Gods stretched its iron neck across the Columbia into a formless white. 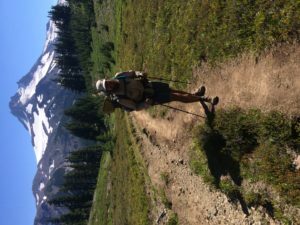 On the first of September, with clean feet and beads of water forming on our rain gear, we crossed into Washington. The Columbia raged below us, carrying a fishing boat beneath our feet. A man driving a logging truck waved and smiled, and soon we were rising up, above the Columbia Gorge and into the clouds. The cloudy sky was no longer a reliable watch for us, and as the color faded from grey to black we searched the clouds for signs of sunset, all of us worrying silently that maybe time was not on our side. 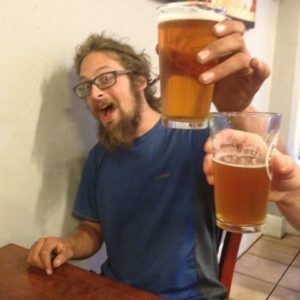 Its good to hear that you’re all still on the trail, though I was sad to hear Bivvy had to drop out. 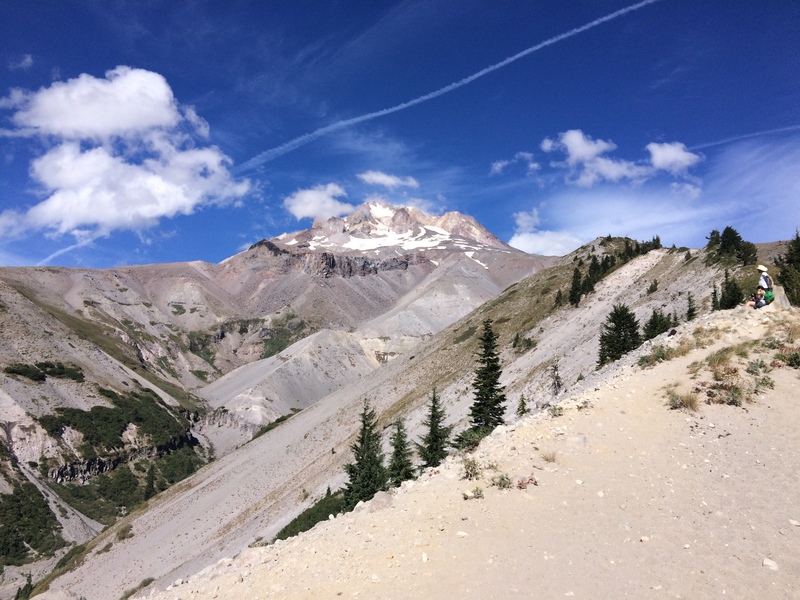 I also met Poptart and Flower when I was hiking with Swiz, a nobo speed hiker. Apparently due to fires they had to abandon their record attempt and Poptart dropped out while Flower is still going. Its kinda nice reading through the blogs of people I met; makes me feel like I’m still on the trail. Stay safe out there. Absolutely! I’ve got Washington written and I’ll be getting it up soon, thanks for reading!